There was a whole lotta reading going on at Gifford Middle School during the 2nd Annual Moonshot Moment Family Literacy Festival, a free event to celebrate and promote literacy and the joy of reading. In the true spirit of community, Moonshot Community Action Network members, local churches, and nonprofits teamed up with The Learning Alliance to celebrate literacy and support the community’s goal for 90 percent of all students to be reading on or above grade-level by the third grade. Volunteers from throughout the community were on-hand to lend support. Children designed bookmarks, made book bags, matched alphabet beans, played sight word games, built sentences and wrote their own books. There were word-eating robots, a letter scavenger hunt, hopscotch word challenges, giant boggle and even a check-writing comprehension activity. La'Niyah Pinckney was deep in thought as she worked on her book. The 9-year-old was writing a story about moving from Miami to Jacksonville. Her aspirations as an author are vast as she explained that she would be reading a poem about her mother's life in the Poetry Jam later in the afternoon. Retired educator and co-founder of the Churchill Center & School, Bonnie Wolfarth spent the day working with children at the Book Tasting table. “There is nothing more important than making sure that these children learn to read by the third grade. It's incredible what two moms who saw a need have been able to accomplish.”? 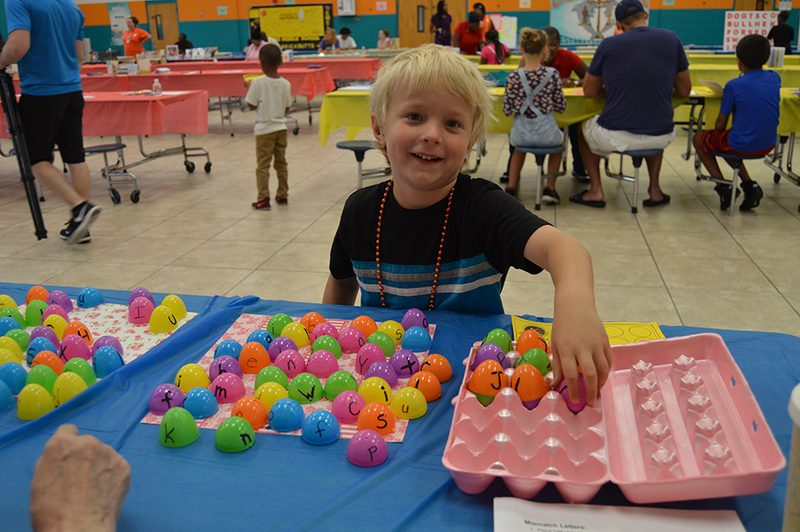 ?Wolfarth noted that she believes The Learning Alliance and their Moonshot Goal has been so successful because they realized early on that they would need to address issues affecting literacy at an early age which makes events like the Family Literacy Festival so important. The children worked up an appetite moving from one activity to the next, showing off their new-found literacy skills and were rewarded with pizza before settling in to listen as contestants offered up original poems during the Poetry Slam competition. Dorrian Bridges took control of the mic reciting several of his original poems in hopes of inspiring young poets. Judges Shawn Frost, Tiffany Justice and Tosha Jones, had a tough time selecting a winner, but in the end, Vivian McFall took home the top prize for her poem, winning an iPad. In addition to a new appreciation for reading, the children left with books in hand and parents took home a new selection of engaging literacy-based activities to help their children become better readers. ?To learn more about the Moonshot Moment Goal, visit moonshotmoment.org.